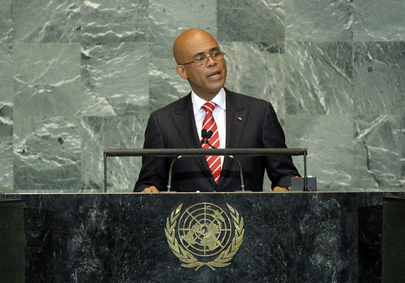 MICHEL JOSEPH MARTELLY, President of Haiti, welcoming South Sudan as the 193rd United Nations Member State, joined the leaders of other countries that had experienced the heavy burden of post-catastrophe or post-conflict situations in saying: “The weakest and the most vulnerable still harbour hope.” They understood that change — in mentality as well as political, economic and social management — must be their key belief. He said he had been elected with a mandate to bring about that change, and that awareness would lead to a new global order. He went on to say that when countries in the global South survived a major catastrophe, it raised questions about whether responsibility should be local or global. Post-disaster situations included those resulting from natural disasters and those caused by human folly, and the response to both must be even more coordinated and audacious. In such instances, it was primarily up to the affected country to find solutions — the people of the global South determining how to use their wealth. By supporting Haiti’s presidential elections, the United Nations had understood the urgency of the situation in his country, he said. However, it would be irresponsible to deny a disaster-stricken country assistance from sister nations in the emerging South or in the North, he said, adding that a balance between mature governance and international assistance should be sought. By way of example, he said that a country in conflict often welcomed United Nations peacekeepers initially, but host-country expectations grew excessive in the medium term. Nothing would be more irresponsible than allowing peacekeeping missions to leave until an alternative was in place, he emphasized, asking what would happen to Haiti if the United Nations Stabilization Mission in Haiti (MINUSTAH) was suddenly to withdraw. “The trees must not hide the forest,” he said, stressing that political stabilization involved several stages and required more than a mere observer force. Noting that the four pillars of his Government were education, employment, environment and the rule of law, he wondered how to achieve universal free education in a country where there was massive illiteracy. With respect to jobs, “we can talk as much as we like about human dignity… but an empty stomach is death to words”, he said. It was with the creation of decent jobs, especially for the most vulnerable, where justice began. On other matters, he said the international community must commit to combat deforestation and climate change, and tackle the problem of water. There could be no peace in the world as long as the environment in countries like Haiti were so degraded that disasters became even more dramatic, floods more severe and drought more deadly.